Sao Paulo, 2013: a city at an extraordinary moment in its history. Mario Leme, a detective in the civil police, has developed a friendship with a young English investigative journalist, Ellie. When she goes to meet a contact in central Sao Paulo, Mario observes from the street as she walks into a building and doesn't come out. Inside, he discovers the dead body of a young man he doesn't recognise, and Ellie's phone lying on the floor. Told partly from Leme's point of view, partly from Ellie's, Gringa takes us through five days during the redevelopment of the centre of Sao Paulo in the run-up to the 2014 World Cup. Ellie's disappearance links characters at every level of the social hierarchy, from the drug dealers and civil and military police to the political class she witnesses the feral brutality of urban breakdown. 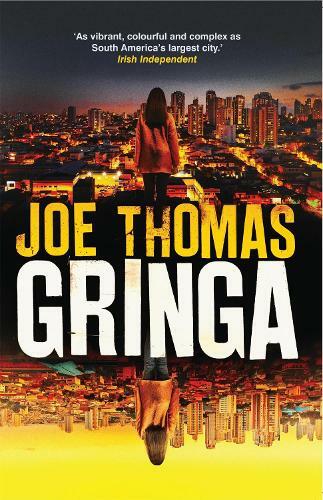 Gringa, with shades of Don Winslow and James Ellroy, is a portrait of Sao Paulo in all its harshness and dysfunction, its corruption and social divisions, its kaleidoscopic dynamism, its undercurrent of derangement, and its febrile, sensual instability, executed with a deep knowledge of the city's anatomy.